Skinny Beach House is found in Dalawella with direct access to the beach out front to its sandy shores and cool water. The stunning property is, in fact, located in a skinny strip of land designed in order to make the most of this strip and give guests a unique experience in Sri Lanka’s Southern coast. With nothing and no one to disturb the resounding peace and quiet of the area, guests of Skinny Beach House are guaranteed a restful vacation with a mind to recharge and rejuvenate their mind, body, and soul. The beach house boasts two, well-furnished and minimal bedrooms with deluxe, king-sized beds featuring quality linen. Once assured of a good night’s rest, you can begin to truly appreciate the understated beauty of these bedrooms done up in shades of white, brown, and hints of aquamarine. The simple décor goes a long way to provide a homely ambiance, and the even lead to the terrace where you can enjoy the fresh breeze and the sun on your skin. The bedrooms are adjoined to en-suite bathrooms that are mosaic-tiled, very tropical, and with amenities such as showers, vanities, and organic toiletries. 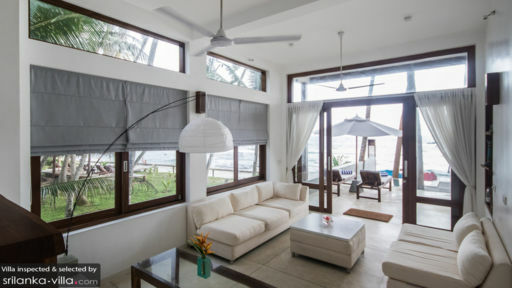 At Skinny Beach House, what stands out is the structure which is a narrow building housing two bedrooms, living and dining space, and an outdoor yard with plunge pool. With everything you could possibly need in this limited space, you know there has been an optimum utilisation of space. The plunge pool is great for splashing around and cooling off, even if you want to just float around. You can always head to down to the sandy beach and swim in the safe water or indulge in a water sport like snorkelling. There are beach chairs for you to relax and sunbathe on as well! 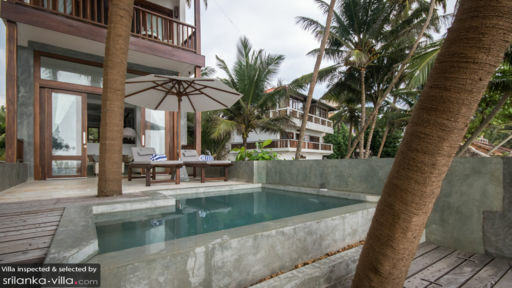 The living area is found on the ground level overlooking the beach and the plunge pool. Sourced from locally-produced natural materials, the furniture found in the living area is comfortable, well-appointed, and elegant. The narrow room features two large, plush white couches, whitewashed walls, large windows with scenic views and lighting for when the sun sets. The cool interiors compliment the tropical weather outdoors, giving you a way to blend the outdoors with indoor living. There is a dining area for guests as well where they can enjoy a feast of Sri Lankan offerings and the staff can help to cook dishes as there is even a fully-equipped kitchen. The kitchen has its own cocktail bar, a Nespresso Coffee machine for your early morning fix, and other necessary amenities. While you’re staying at Skinny Beach House, you are in the lap of utmost comfort where you can truly relax letting go of all your worries. Modern comforts such as high-speed internet and wifi, bluetooth speakers, and a 50” TV can be made available to guests. There is a house manager to look after the needs of guests and they can even prepare scrumptious Sri Lankan and international dishes for you upon request! Dalawella has stunning beaches where guests can opt for water activities like diving and snorkelling. 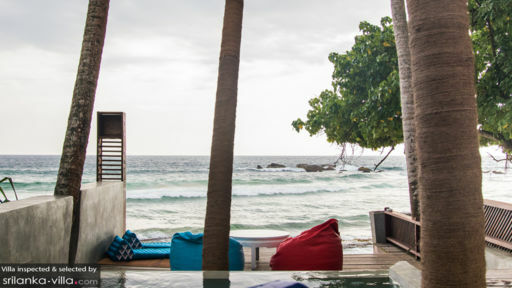 At the beach house, you can even request for excursions and trips to Galle city with its famous Dutch Fort – a UNESCO World Heritage Site – turtle sanctuary, and even go whale-watching.